The Department of Defense announced today the death of two soldiers who were supporting Operation Iraqi Freedom. They died in Baghdad, Iraq on May 4, when an improvised explosive device detonated near their RG-31 Mine Protected Vehicle during combat operations. Reinke and Quinton were assigned to the 5th Engineer Battalion, 1st Engineer Brigade, Fort Leonard Wood, Mo. Staff Sgt. Gavin B. Reinke, 32, of Pueblo, Colo.
Spc. Bryan L. Quinton, 24, of Sand Springs, Okla.
Staff Sgt. Gavin Reinke and his daughter, Kayleigh. A former Pueblo man was killed in Iraq on Thursday when he was attempting to help squad members who had been hit by an improvised explosive device. U.S. Army Staff Sgt. Gavin B. Reinke, 32, is believed to be the first Puebloan in uniform killed in the Iraq war. A civilian contractor with Pueblo ties was killed in 2004. According to Reinke's father, Scott, Gavin was in command and driving a MAC IED recovery and disposal truck in Baghdad, sweeping the area of the explosives used by fighters resisting American presence. When soldiers following Reinke's vehicle were hit by an IED, he turned the MAC to aid the troops. "He turned to help the Humvee behind and his unit was hit," Scott Reinke said. Another soldier, Spc. Bryan L. Quinton, was killed in the attack. No hometown was listed for Quinton. "That was typical of Gavin," said his mother, Karen, of Pueblo. "He was trying to help his troops." Reinke, a 1993 graduate of Central High School, was on his second tour in Iraq. 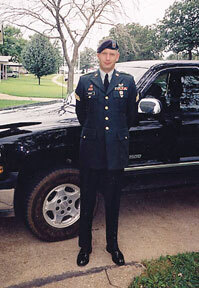 Stationed at Fort Leonard Wood, Mo., since around the 2001 terrorist attacks, he was a member of the 5th Engineer Battalion, 1st Engineer Brigade, and was a combat engineer. 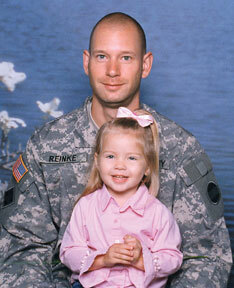 Reinke joined the Army in 1996 after attending Pueblo Community College. He had served one tour in Iraq, March 2003 to March 2004, and began his second tour there in November. "He was planning to be a career soldier," his mother said Friday in the Reinke home near the PCC campus. "He loved his job, his work, his squad," Scott Reinke said. "He believed in what he was doing there." His mother added, "Gavin was a kind, compassionate, caring man." The Reinkes were alerted to their son's death by Fort Carson soldiers on Thursday. "I never thought it would be us," Karen Reinke said. Reinke’s wife, Carole Reinke, also said she was not surprised to hear her husband died while trying to help fellow soldiers. "That’s exactly the kind of person he was," Reinke said from her home in Saint Robert, Mo., where she lives with their 3-year-old daughter, Kayleigh. "He was an amazing man. As a friend, as a father, as a husband, and it carried over to being a soldier." She said her husband wasn't an outgoing person, but once people got to know him, he would do anything to help them. When they lived on base, he would take the time to mow the lawn of his neighbor, a single mother, when he had finished his own, she said. "Everybody that knows him is just as proud as they can be of what he did," Reinke said. Gavin Reinke is survived by his wife, daughter, his parents; and a brother, Daran, of Pueblo. - Staff writers Jeff Tucker and Margie Wood and the Associated Press contributed to this report. We have returned to camp liberty from our mission outside of Baghdad. It was tuff but mission accomplished, it is now back to our route clearance of the Baghdad area, 10-12 hour days out on the road looking for those darn roadside bombs. The temps here are starting to climb into the hundreds and won't be long till they hit the 120 mark. The squad has changed since the last time i wrote in, They have moved on to greater positions of responsibility. We will miss them however i have recieved new soldiers in there place and could not ask for a better group of guys. I will send another picture soon of all of us when we are all here at one time, we are currently in the process of sending our soldiers home for R&R. If you care to send anything for us we do live better then some, and have all the extras such as continuous power to our computers tv,s dvd players and frigerators. So any movies, personal hygiene such as shampoo, shaving cream, tooth brushes, deodorant things along that line would be great. Books to read and magizines are always a plus, anything from newsweek to video games to sports. Any type of snack food, we take those with us on our missions and of course any letters are always welcomed, we do our best to write all but at times we are a little overwhelmed with our missions. Thank you for your support of all the troops here and in Afganistan. You are the reason we serve our country. Greetings from Iraq yet again, let me first appoligize for the lateness of my correspondence, we have been extremly busy, had not had alot of free time on my hands as before. 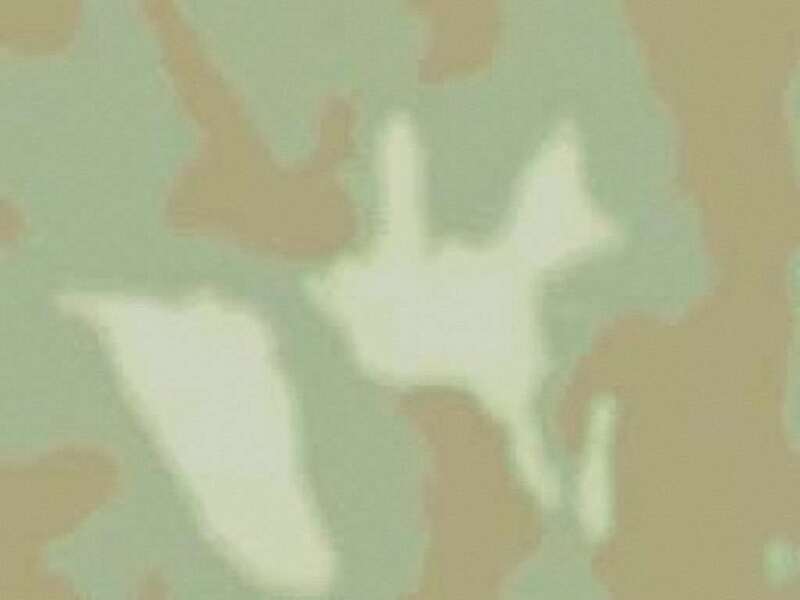 I was redeployed to another little outpost on the outskirts of Baghdad and had no e-mail capabilities to send in my update to anysoldier.com. More to follow. I would like to say thank you all for all the cards and care packages sent up to this point. It means alot to us soldiers for all the support we have throughout the United States. 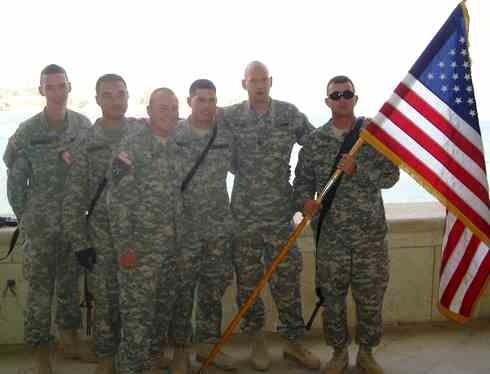 Included is a picture of the squad you great Americans are supporting.It is from SGT Moore's (from Tennessee)reenlistment at one of Saddam's old Palaces from left to right: PFC Fisher from California, SPC Garcia from California,SPC Jasa from California, Myself from Colorado and SGT Bowlin from Arkansas. I have two more soldiers that are attached to another group there pictures will come soon. PFC Lufkin from Illinois and PFC Lasham from Arizona. Some things to add to the list would be baby wipes and things to drop would be the white t-shirts. Everything has been used and is greatly appreciated from all of us. Again It makes me proud of all the support you give to the men and women of the United States Armed Services! We are currently living in trailers 2 per, our electricity is 220 found out the hard way. No need to send food except for snacks and candy. no microwaves but do have laundry service. I am a squad leader of a squad and we are out of Fort Leonard Wood, MO. We are the 5th Combat Engineers, and will be conducting route clearance missions throughout Iraq. I have a few Soldiers that have not recieved any mail, my wife trys to write them but sometimes gets overwhelmed with day to day activities at the home front. I heard of ya'll and think it is great what ya'll do!